Did you ever watch the TLC show 'Trading Spaces'? I was obsessed with it. Obsessed I tell you. Brandon and I were dating then and it would come on on the weekends and I was all about staying home with rice crispy treats and Trading Spaces. Talk about a cheap date. I wanted Vern to come decorate my house one day and I wanted to be BFF with Genevieve. Now that I think about it, not much has changed. I would much rather stay in on the weekends with a few episodes of House Hunters, Brandon by my side and Ben & Jerrys in my hand. This all has absolutely nothing to do with the post except that when I wrote the title, I thought of the show. So, a few months back I decided it was time to combine the girls together into one room. Mia was ready to transition from a crib to a big girl bed, her room is pretty large, and we needed a space to use as an office for Brandon now that he works from home. It just made sense to move Bella out of her room and into Mia's. I was a tiny bit nervous about how they would do together. Bella is majorly independent. And even more so, she loves her sleep. Mia is a free spirit and would have an all night dance party in her room if Bella let her. Fortunately she doesn't. Girl means business when it comes to her sleep, so it has worked out really well. Even if we had the extra space to keep them separate I'm not so sure we would. I shared a room with my sisters growing up so it just feels right to have them sharing. My favorite thing is to walk in on them playing some made up game or setting up houses for their Barbies. Takes me right back to the days I was doing the same with my sisters. The main thing I tried to do was keep it fun and of course girly. I also wanted to do little things here and there to differentiate the two girls in some way. I came up with the idea of the monogram letter over each of the beds and then went from there. 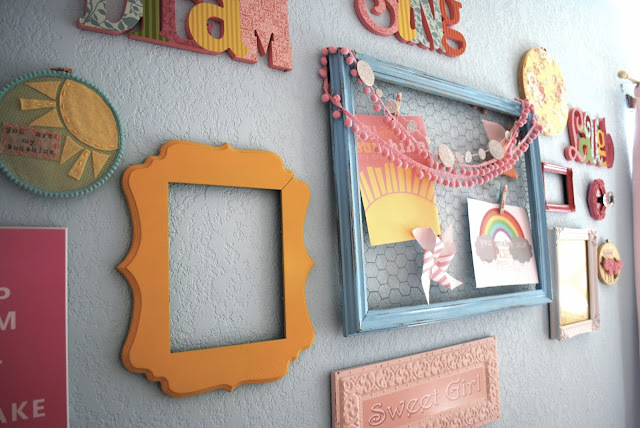 Most of the prints and hoop art in their room are from Blossom & Vine. 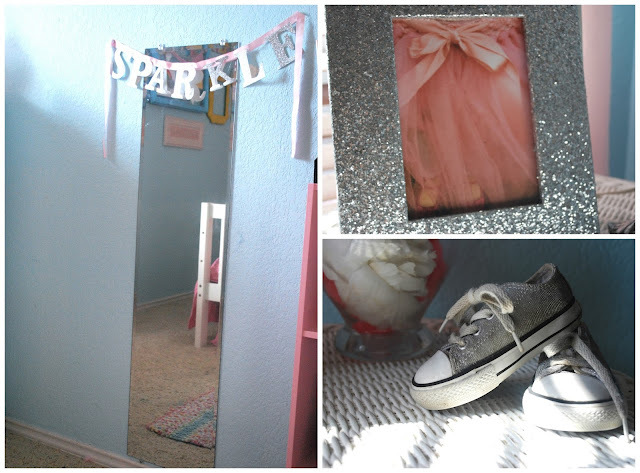 DIY Glitter Letter Monograms found: Here. The girls have loved sharing a room and I love that they are together. I am sure when they get older, we will reevaluate, but for now its working for us. Thank you McKenzie! It's been fun so far! LOVE IT!!! The stripe wall is my favorite part, you did an awesome job! 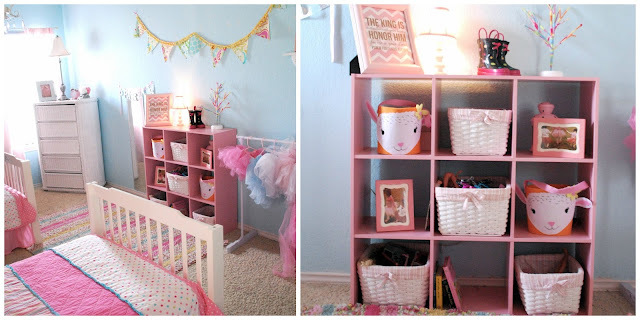 I'm using the same colors in my nursery, but I kept the walls white because I have a hard time committing to color. Ahh SO precious! 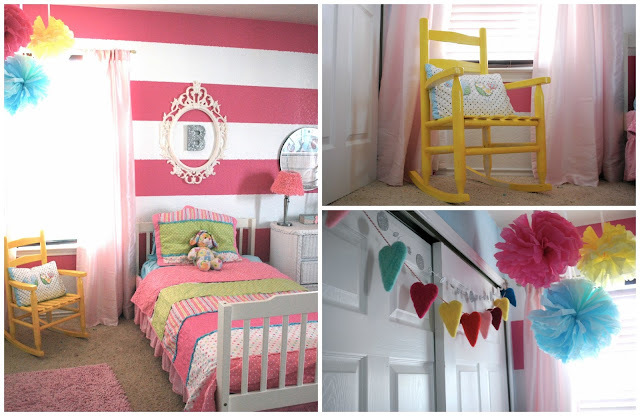 What a beautiful little girl's room, and so fun! I LOVED Trading Spaces too! Awesome show! GREAT JOB! SO GIRLY AND SWEET! 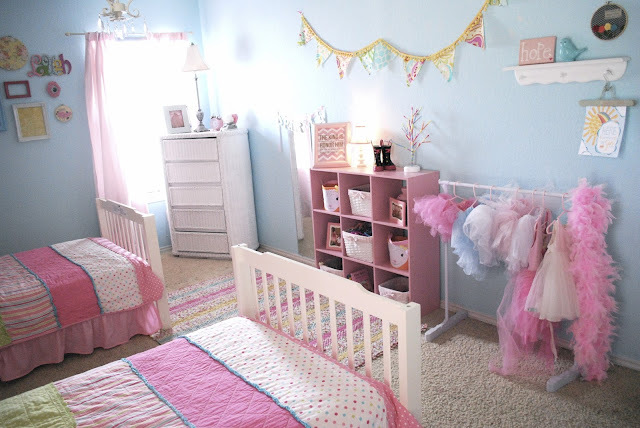 oh my goodness, i'm sure my daughter would shriek looking at your daughters' room. it's so cute! you did an awesome job. and yes, trading spaces was one of the best shows. if you ever have Genevieve come and do your house one day, tell her one of your readers also loves her. maybe she can hop on by to my house too! Haha! wouldn't that be awesome if she did show up to one of our houses?! 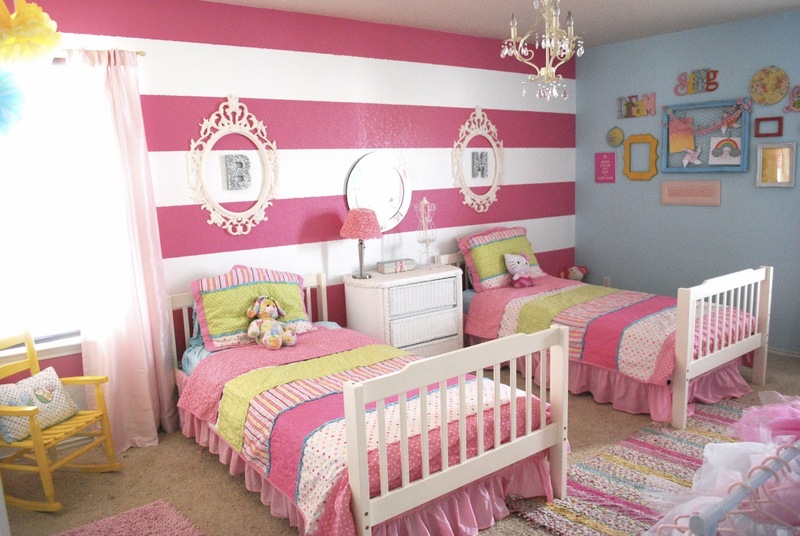 Oh my sweetness..girliest room ever. I bet they LOVE it. I can only imagine the sweet giggles that come from that space. I love their adorable room! It's absolutely precious!!! I'm right there with you - even if Nate and I have room for our kids to have separate rooms, I don't think we'll do it. its so fun to watch them learn how to adapt to one another...it's good for them! Their room is amazing! Beautiful and fun! Ernest Tyldesley once told me that he often had no alternative but to play at least three balls an over, on a batsman's wicket, straight to mid off, an inch off the spot where Rhodes had planted mid off.Rhodes made himself into a batsman by practice and hard thinking. He was one of the first batsmen to adopt the full fronted stance, left shoulder pointing to forward leg. But it is a mistake to suppose that his batting was perpetually dour and parsimonious in strokeplay. Severe depression can be intense and unrelenting.Unfortunately, depression in men often gets overlooked as many of us find it difficult anime shirts to talk about our feelings. Instead, we tend to focus on the physical symptoms that often accompany male depression, such as back pain, headaches, difficulty sleeping, or sexual problems. This can result in the underlying depression going untreated, which can have big brother shirt serious consequences.